Hiking the Appalachian Trail involves more than just grabbing a backpack and heading off into the wild blue yonder. Considerations such as what to pack and whether you’ll camp with a tent or use the many trail shelters dotted along the AT are only the tip of the proverbial iceberg. 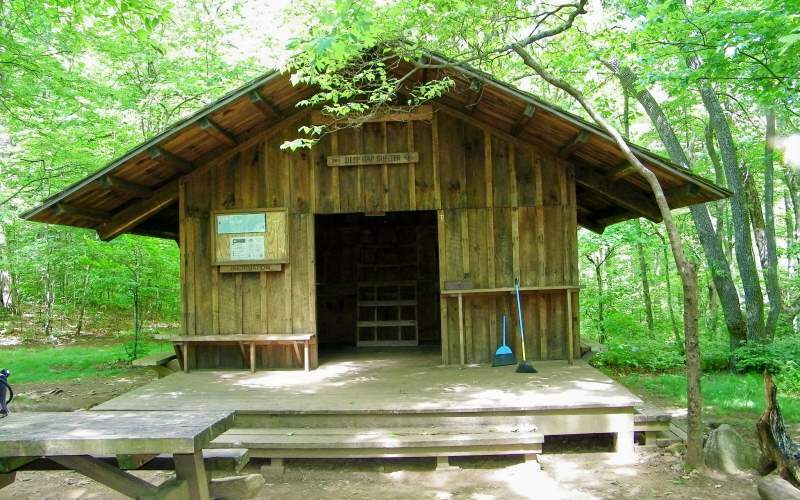 2 What Are Appalachian Trail Shelters? 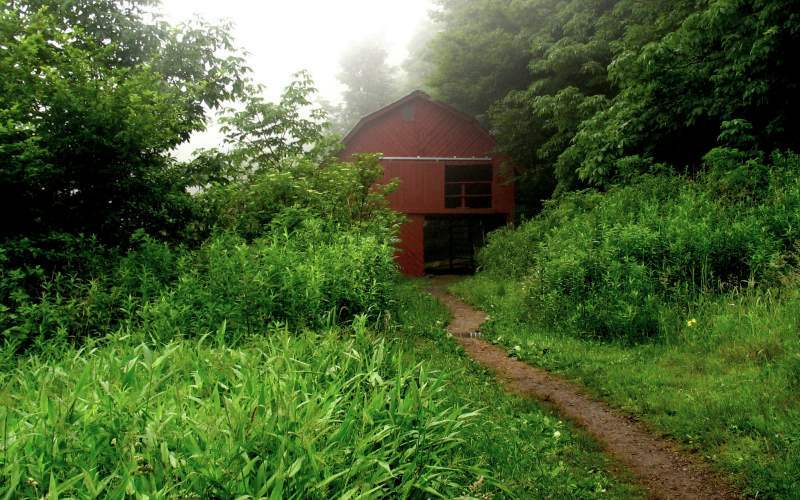 4 What Are The Appalachian Trail Shelters Like? The Appalachian Trail is nearly 2,200 miles long stretching from Maine to Georgia, cutting through a variety of terrains and climates. There are also many different sections of the Appalachian Trail where hikers can access camping shelters if they decide not to set up on their own. Familiarize yourself with the AT’s camping regulations before setting out, to make sure you don’t break the rules. 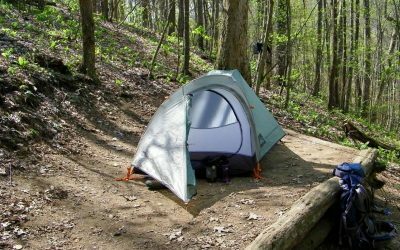 Whether you decide to stay in the shelters on the Appalachian Trail, use a tent on your own campsite (dispersed camping) or set up on a designated campsite, there are several things you need to know. While you might prefer the independence and freedom of dispersed camping, it is recommended – for safety reasons – that you use the designated camp sites, of which there are around 100 on the trail. Otherwise you can set up in the immediate areas surrounding the majority of the 250 shelters available. Another reason for using the designated campsites is the conservation of the flora and fauna, which protects the integrity of the trail. These areas are mostly flat for pitching a tent and close to creeks or springs, but there are only a few spots that have bathroom facilities. Some people can clock more miles of hiking when choosing to camp with a tent, due to the restricted distances when aiming to stay at a shelter, but for others it works the opposite – as it all depends on your hike and your abilities. There are also different types of shelters available on the AT. You could hike the entire trail without having to pitch a tent but having one in circumstances where there’s no room in a shelter will be a relief. On average, the distance between the shelters is 8.5 miles with a couple having longer stretches. Nearly all shelters are free apart from a few in New Hampshire and Vermont. The beauty of using the shelters is that you don’t have to bother trying to locate a water source and you save time by not having to pack up a camp before getting back on the trail. There’s also the added bonus of making new friends when meeting other hikers and keeping dry during rainy nights. The first few weeks might be better for using your tent as crowding can be an issue. Most thru-hikers start at Springer Mountain and about a quarter drop off after the first few weeks. After all is said and done, you might want to mix it up to get the full experience of hiking the Appalachian Trail. What Are Appalachian Trail Shelters? Most of them are three-walled lean-to shelters and some are four-walled. There are a couple of cabins and a few of the shelters have fireplaces or fire rings, pit toilets, bunk beds or hiker shelves and a water source nearby. One of the shelters is an old barn, so there’s a variety which makes the choices a novel interlude on a long hike. With over 250 shelters on the AT, it’s important to remember that availability is on a first-come, first-served basis. Seeing as some shelters can range from 15 miles+ apart, there’s also the option of staying in town during those longer stretches, unless you decide to pitch a tent on an Appalachian campground. Some shelters in popular areas require registration and/or fees as well as a permit. This is to ensure that the caretakers can keep the areas clean and for educating hikers about using the AT responsibly. Mostly applicable in New England, the fees average $10 or less. 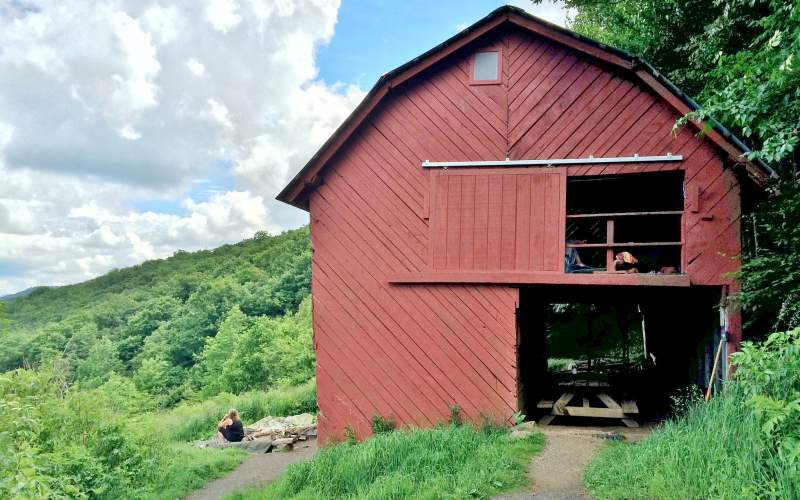 What Are The Appalachian Trail Shelters Like? 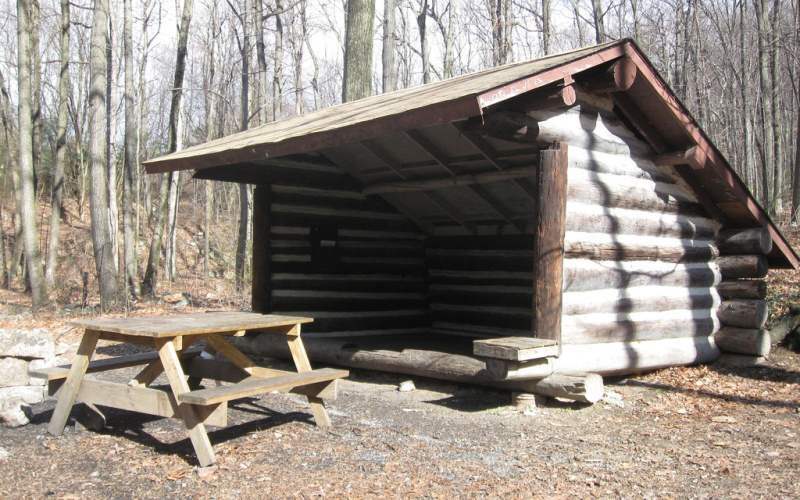 As discussed previously, the Appalachian Trail shelters have a lot to offer, in terms of protection from the elements and proximity to facilities and water sources, but don’t expect a stay that’s equivalent to a comfortable hotel room. Most are open and very rustic with wooden or dirt floors. Some are merely a roof over your head and might have a leaky roof. A few have porches, wood stoves or open-pit fireplaces and some even have solar-powered showers, although they sometimes don’t work too well. You may find that you have to share the shelters with the occasional mouse, and sometimes they fill up quickly, especially when it rains. Most of the time, hikers won’t turn others away if the shelter is full, but it might mean having to share a bunk or sleeping in a sitting position. Here are pictures of a few of the trail shelters you’ll find along the AT. 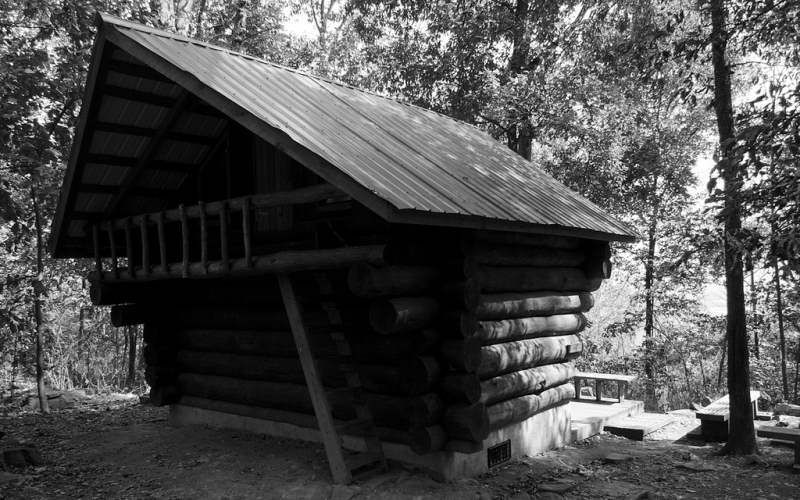 This is the Deep Gap Shelter, located 3.5 miles south of Dicks Creek Gap via a 0.3 mile side trail. This picture is of the Windsor Furnace Shelter, a more primitive pit-stop, but still a welcome sight, especially in rainy weather. This shelter is located in Berks County, Pennsylvania. The Ed Garvey Shelter on the Appalachian Trail is in Maryland, and you can find it just north of Harpers Ferry, WV. Just like staying overnight at a friend’s place, you need to behave yourself appropriately. The fact that you’re “roughing it” and hiking in the great outdoors doesn’t give you license to act the fool. Treat the shelters, the grounds and other hikers with respect, as news travels fast along the trail so you want to preserve your good reputation. Clean up after yourself and keep the grounds free of litter. Don’t “spread” your stuff around or “stake a claim” like you own the shelter. Always be polite and try to make room for other hikers. No graffiti or tagging is allowed. Don’t leave or burn your waste in the fireplaces or firepits. Make sure that you extinguish your fires completely and appropriately. For most hikers on the Appalachian Trail, camping is an integral part of the whole backpacking experience. While some like to mix it up with the usage of shelters and motels in the various towns along the way, there’s nothing like sleeping under the stars or setting up a nice camp. Apart from packing appropriate and lightweight gear for your trek, as well as proper planning and research before you set out, there are several rules and guidelines to keep in mind when traveling on the AT. It’s also important to be aware of the wildlife, specifically snakes and bears, so give them a wide berth. Setting up a camp usually involves a campfire, for warmth, cooking, light and social interaction if traveling in a group. It’s essential to know how to properly build, maintain and distinguish a fire for the sake of the trail as well as the safety of yourself, other hikers and wildlife. Also, make sure that you know beforehand where you can and cannot set up a campfire, as there are restrictions and prohibited areas in certain sections of the AT. Many areas only allow fires on designated sites and there are particular rules for the areas where you can set up a campfire. Conditions: is the area affected by drought? If so, the chance for wildfires is increased dramatically. Conservation: only use small pieces of wood gathered from the grounds and keep fires small. Designation: use fire rings at designated sites; be mindful of using cleared grounds with no dry vegetation close by. Cooking: to prevent embers and sparks flying off into the vegetation, only use camp stoves for cooking. Trash: Never burn your trash, as harmful chemicals can damage the waterways and the environment. Knock it down: use a stick or shovel to break the embers up until there are small or zero flames present. Mix it up: stir up the dirt, ash and coals underneath while trickling water over it slowly. Test for heat: by hovering your hand over the area. Repeat the previous step until no heat is detected. Make it cold: continue trickling water and stirring with your hand until the area is cold. Clean it up: pour water over the stick if you used one (or the shovel) and clean your hand. It’s better to err on the side of caution, so you might consider using other ways of keeping warm and lighting your camp area. Think about insulating materials and moisture-wicking fabrics (some can actually keep you warmer than a campfire). Use a headlamp for light which is good for hands-free movement around the campsite and the trail. When hiking and camping on the AT, comfort is a major consideration, especially when it’s time to sleep, so make sure that you weigh up all the pros and cons before you start your trek. 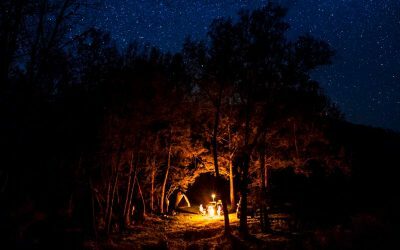 Whether you choose shelters, camping with tents or a mix of the two, it could make the difference between a great trip and a bitter disappointment.